As an ode to the beginning of spring, I've been sipping on this gorgeous and healthy smoothie that tastes like dessert. I've been feeling a little off balance from the time change. Although I love how it stays light out later, waking up in the dark has felt unnatural and made it harder to get out of bed. 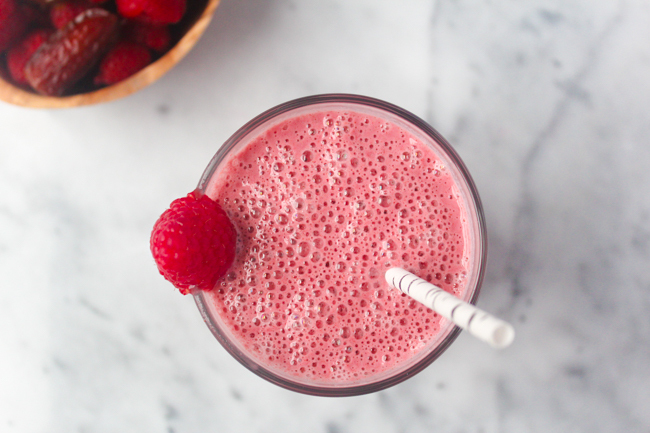 This smoothie has not only brought more energy to my mornings but the refreshing flavors and beautiful color make me excited for all the fun aspects of spring, which feel like they're right around the corner. 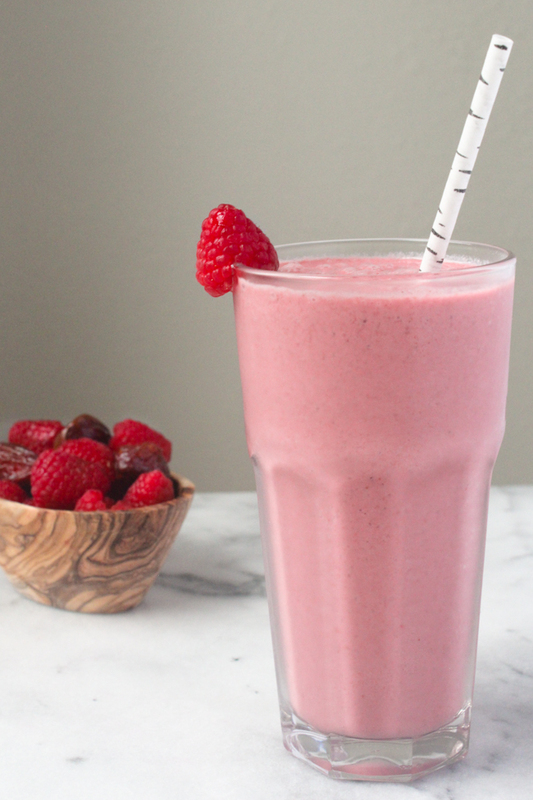 There's also only five ingredients: raspberries, almond butter, almond milk, vanilla extract and dates. Meaning this recipe is not only easy to make but also easy to shop for. Once you stock up on all the ingredients, they will store well in the freezer and pantry for the next time you want to make this smoothie, which if you're like me is all the time. Raspberries have a unique composition of vitamins, minerals and antioxidants. Several studies have shown that they can improve memory, support heart health and even protect eyes from UV light damage. 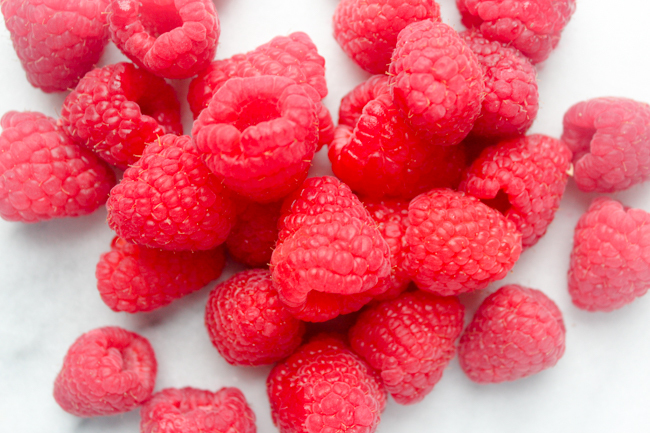 Raspberries are also full of fiber, which helps you feel fuller longer and aids in digestion and detoxification. Dates are another ingredient with tons of fiber. 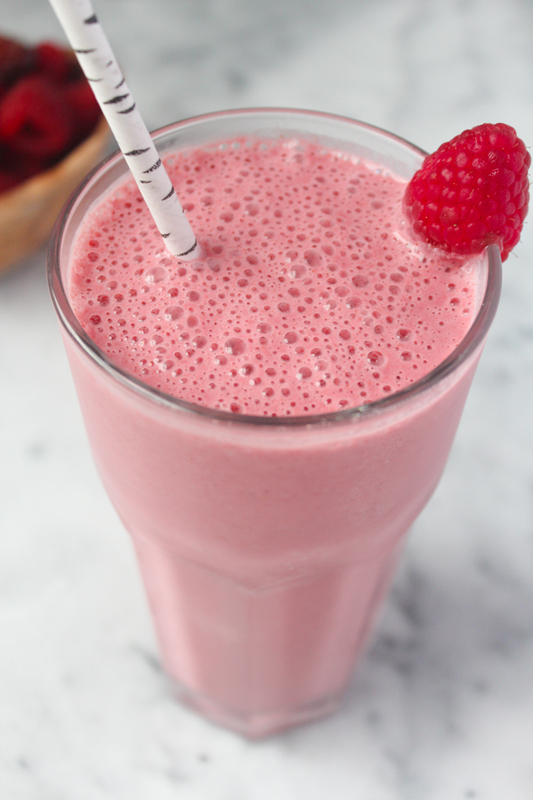 They're caramely flavor compliments the raspberries and vanilla so nicely in this smoothie and brings such a delicious, natural sweetness. This smoothie would be the perfect morning pick me up or weekend refresher to enjoy as we welcome spring. - Add all ingredients to a blender and blend until smooth. Soo yummy and healthy! Thanks for reading! but this looks soooo amazing. I will definitely try this out. Thanks for sharing! So delicious! Thank you for stopping by love! This sounds great, i'm definitely going to give it a try! I think your blog is lovely, let me know if you would like to follow each other! This looks sooo good. For frozen raspberries, do we get fresh berries and then just put it in the freezer? Or buy it already frozen? Delicious and healthy! I need to make this!! !